Leaf Sentry gives you peace of mind. The Leaf Sentry guarantee gives you our Lifetime Freeflow Warranty, Materials Warranty, and our Paint Finish Warranty. Leaf Relief® is the perfect solution for homeowners who need a gutter solutions that works each and every time. Our patented Aluma-Perf TechnologyTM keeps debris out of gutters, ensuring that water flows freely throughout the entire gutter system. Leaf Relief® mounts securely to the gutter system, resisting damage from high winds, heavy snow and the most dreaded of all, ice! The tough aluminum construction of Leaf Relief® is indelible and resists damage from pests and insects. Leaf Relief® is designed to end routine gutter cleaning, which in turn eliminates maintenance and hassles. Put an end to your gutter cleaning days with Leaf Relief®! Don’t just take our word for it! Independent testing confirmed Leaf Relief® works better than other gutter systems on the market! How? 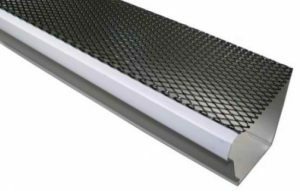 Gutter Mesh is a high quality Aluminium Mesh that perfectly covers your existing gutters to prevent the blockage of leaves and debris. Leaves and debris in your gutters will ultimately lead to blocked downpipes and limited waterflow to your tank. Also blocked Gutters and Pipes will cause water to cascade over on to your home and foundations leading to unknown long term consequences. 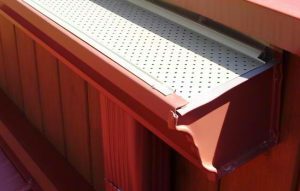 Gutter Mesh utilizes high quality materials with mesh openings that let maximum water flow in and prevents debris in. In the majority of homes you cannot see Custom Gutter Mesh from the ground thereby not detracting from your home’s appearance.